After the premiere of The Dark Crystal at the end of 1982, Jim turned his attention to his next fantasy film, Labyrinth. 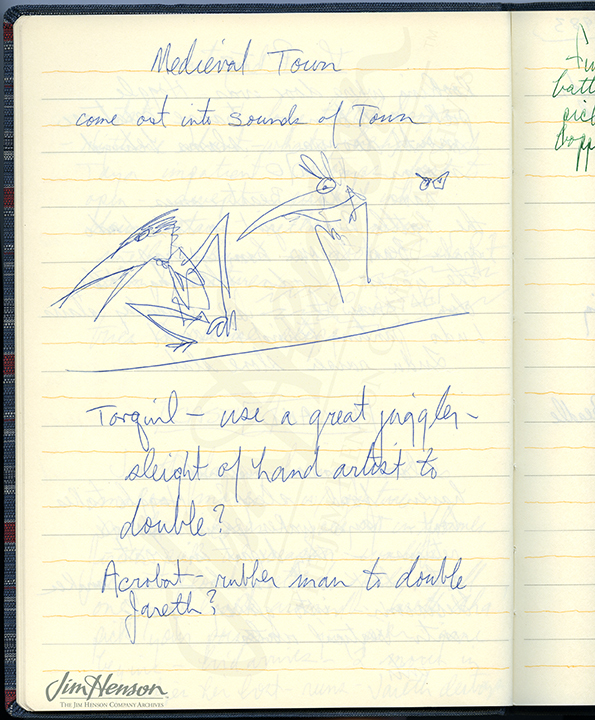 His Creature Shop was established and eager for new projects, and Brian Froud was excited to begin another film with Jim. 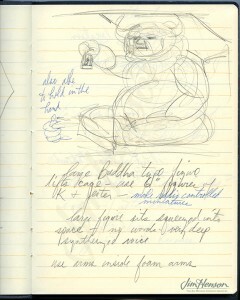 During a trip to Japan in March 1983, Jim filled a notebook with ideas for various interactions and characters in the film. 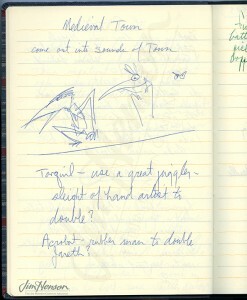 The Dark Crystal taught him that story was paramount, and he asked Fraggle Rock lyricist (and Canadian poet laureate) Dennis Lee to help develop a narrative. 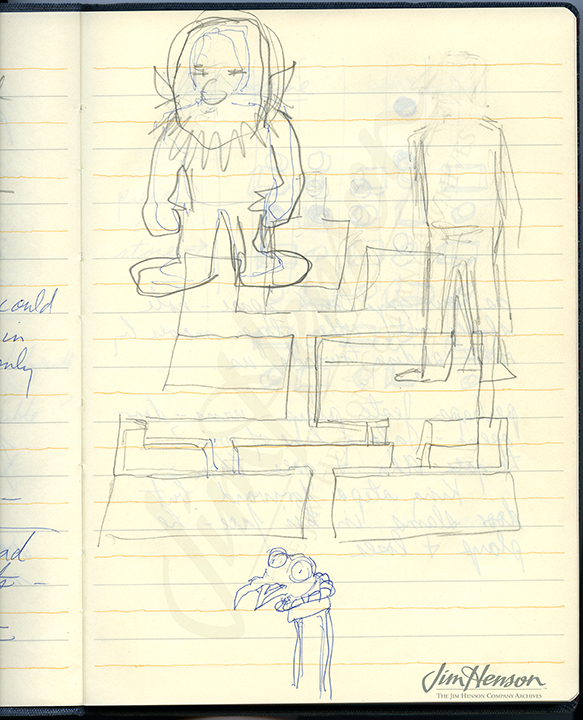 After several meetings and using both Jim’s ideas and concept art from Froud, Lee produced a “poetic novella” outlining a coming-of-age story set in a Froudian world of goblins, hairy beasts, and animated masonry. This time, humans were central to the story, which was drafted into script form by Terry Jones and Laura Phillips over the next year. Focusing on the emotional journey of the main character, Sarah, Jim sought input from his producer, George Lucas, numerous Henson colleagues, and from writer/actor Elaine May. By April 1985, the script was ready and cameras started rolling on Labyrinth. 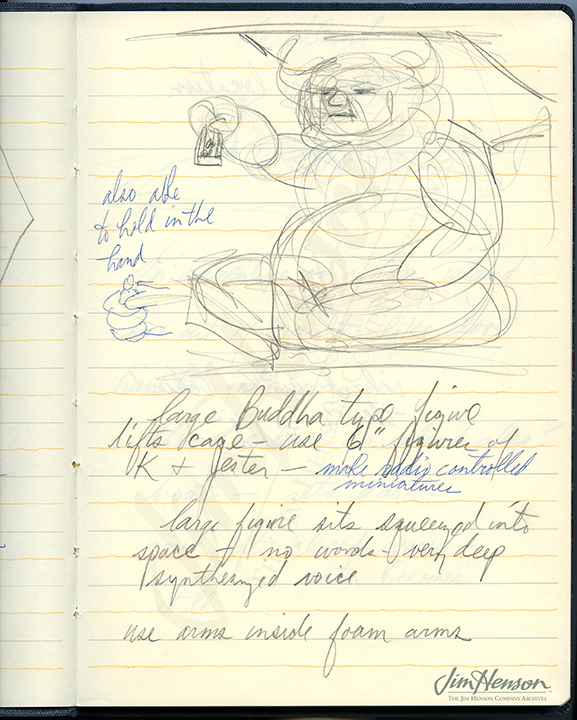 Pages from Jim’s Labyrinth ideas notebook, 1983. 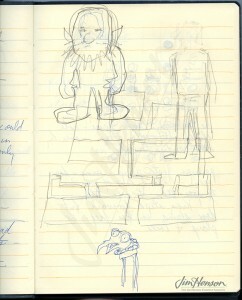 This entry was posted in 12-December '83, 1983, Labyrinth and tagged Brian Froud, Creature Shop, Dennis Lee, Elaine May, Fraggle Rock, George Lucas, Japan, Labyrinth, Laura Phillips, Lee, Terry Jones, The Dark Crystal. Bookmark the permalink.